Last week we started a sermon series on the seven churches of Revelation. A lot of times when people read this book, they don’t realize it contains seven letters by Jesus sent to seven churches in Asia Minor (modern day Turkey). Each of these seven churches was unique, each had its own struggles and issues to deal with. For instance, the church in Ephesus Jesus commanded to repent since they had forsaken their first love. The church was not as loving as it used to be. The church we’ll look at today is Smyrna. What do we know about Smyrna? Smyrna is called today Izmir (Today, Izmir is the third largest city of Turkey with a population over 4 million. It’s a modern city and one of the main hubs for exporting various agricultural and industrial products from its port. It was the birthplace of Homer; in the first century this city was very religious, it contained the temples of Zeus, shrines of Apollos. Caesar worship began in this city in 196 BC. Each year Roman citizens had to burn a pinch of incense on the altar and acknowledge publicly Caesar is lord. Many Christians who refused to worship the emperor were burned at the stake and fed to wild animals. Polycarp, was a bishop of the Church in Smyrna. He was a disciple of John the writer of Revelation. Revelations 1:10-11 Jesus commanded the apostle John to write what he saw and send it to the seven churches. We know these are seven letters of Jesus sent to seven churches because he identifies himself at the beginning of each letter. Furthermore, Jesus himself is the author dictating to John what to write. “To the angel of the church in Smyrna write (v.8) These are the words of him who is the First and the last, who died and came to life again. This is a title of Jesus :the first and the last (Revelations 1:8 I am the Alpha and the Omega, v.17-18 Don’t be afraid, I am the First and The Last, I am the Living one; I was dead and behold I am alive for ever and ever! And I hold the keys of death and Hades. Jesus knows what is going on in his church. (v9) “I know your afflictions and your poverty (yet you are rich). Jesus knows those who slander of those who say they are Jews but are not. This church was being afflicted by persecution. The word slander is the word for blasphemy, these people were slandering or speaking abusively against some in the church. They say they are Jews, but Jesus said they are not. (In the New Testament being Jewish has to do with sharing Abraham’s faithfulness. It didn’t simply mean lineage) All Jewish people considered Abraham their father, Abraham is the father of the faith, so to believe is in a sense to be heir of Abraham. Jesus called these malicious talkers, impostors, not Jews because they are not acting as true Abraham’s descendants. They were not acting as true believers. In fact Jesus called him, members of Satan’s church (synagogue). These group that was slandering the church, Jesus said, they belong to the synagogue of Satan. (That is exactly what they were doing, the job of Satan in the church). In John 8:42-46 Jesus called the religious leaders sons of the devil because they were trying to kill Jesus. Jesus encourages this church to not be afraid. Don’t be afraid of what is happening and what the future will bring. Be faithful to the point of death and I will reward you. How faithful will you be in the midst of persecution and trials? These tests or trying times you are about to experience will test your faithfulness to God. There are Christians who run away at the sight of any conflict or trial, they give up their faith, they give up on God and the church. Jesus said expect trials and persecution, this may not be easy, but be faithful to the point of death. Be faithful even if it cost you your very life. We don’t know what this means yet in this country. Polycarp knew exactly what it meant to be faithful to Jesus even to the point of death. He died for being a Christian. 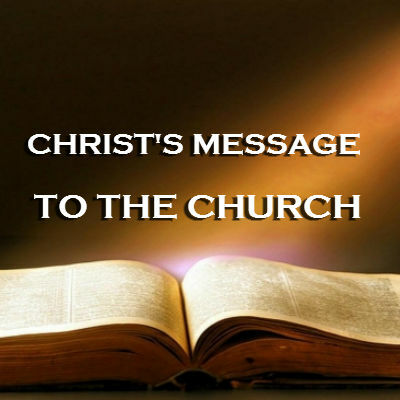 (v.11) HE who has an ear let him hear what the Spirit says to the churches. He who overcomes will not be hurt at all by the second death. What does Jesus expect of his church today? Jesus’ church is one who perseveres through trials without giving up. Christ’s church is one who is faithful in good times and bad times. Faithful in the midst of persecution from the outside and within. Jesus is saying to his church today, times may be tough tomorrow, but remain faithful to me, even to the point of death. He knows what we go through as his church. –Jesus’ church overcomes this world and all its issues and struggles. As a church part of running the race includes keeping the faith, fighting the battles without giving up, staying faithful to the course. Paul said at the end of his life when he knew he had to be faithful to the point of death, writing from a prison cell waiting to be executed. 2 Tim.4:6-7 For I am already being poured out like a drink offering, and the time for my departure is near. 7I have fought the good fight, I have finished the race, I have kept the faith. 8Now there is in store for me the crown of righteousness, which the Lord, the righteous Judge, will award to me on that day—and not only to me, but also to all who have longed for his appearing.